The purpose of this chapter is to highlight current recommendations regarding colorectal cancer (CRC) screening and post-polypectomy surveillance colonoscopy in older adults and to review the available literature in order to help inform decision-making in this age group. Age is a risk factor for CRC; however, older adults with a history of prior screening are at lower risk for CRC compared to those who have never been screened. 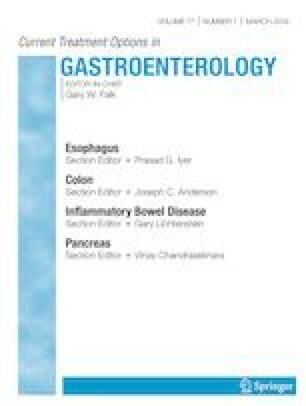 Decision-making for CRC screening and post-polypectomy surveillance colonoscopy in older adults is complex and several factors including age, screening history, comorbidities, functional status, bowel preparation, prior experiences, preferences, and barriers need to be considered when weighing risks and benefits. Recent guidelines have started to incorporate life expectancy and prior screening history into their recommendations; however, how to incorporate these factors into actual clinical practice is less clear. There are limited data on the relative benefits of screening and surveillance in older adults and therefore, at this time, decision-making should be individualized and incorporate patient preferences in addition to medical factors. Jennifer K. Maratt declares that she has no conflict of interest. Audrey H. Calderwood declares that she has no conflict of interest. Noone AM, Howlader N, Krapcho M, et al. SEER Cancer Statistics Review, 1975–2015, National Cancer Institute. Bethesda, MD, https://seer.cancer.gov/csr/1975_2015/. Accessed 25 Oct 2018. Census Bureau US. Older people projected to outnumber children for first time in U.S. History. https://www.census.gov/newsroom/press-releases/2018/cb18-41-population-projections.html. Accessed 25 Oct 2018. American Cancer Society. Colorectal cancer facts & figures 2017–2019. https://www.cancer.org/content/dam/cancer-org/research/cancer-facts-and-statistics/colorectal-cancer-facts-and-figures/colorectal-cancer-facts-and-figures-2017-2019.pdf. Accessed 25 Oct 2018. ••American Cancer Society. Updates on Colorectal Cancer Screening Guideline. https://www.cancer.org/latest-news/american-cancer-society-updates-colorectal-cancer-screening-guideline.html. Accessed 12 Nov 2018. The American Cancer Society states that adults between the ages of 76–85 should make decisions about pursuing screening with their medical provider, with consideration of their own preferences, life expectancy, overall health, and prior screening history. The also recommended against screening for those over the age of 85. ••Calderwood AH, Anderson JC, Robinson CM, et al. Endoscopist specialty predicts the likelihood of recommending cessation of colorectal cancer screening in older adults. Am J Gastroenterol. 2018 Nov 2. https://doi.org/10.1038/s41395-018-0406-z [Epub ahead of print] Using the New Hampshire Colonoscopy Registry, 85% of adults 70-74 years of age with a normal screening colonoscopy were found to have a recommendation to return for screening (when they would be 80–84 years of age). Advanced age and absence of family history of CRC were associated with recommended to stop screening. Gastroenterologists were more likely to recommend screening cessation for patients of advanced age as compared to non-gastroenterology endoscopists.